This relaxed tour involving lots of bends in the road and viewing points takes you around the two distinctive peaks of Fourni and Agathes, each approximately 1500 m high. You will enter remote villages on tiny plateaus, where only a handful of people live; cast a glance at the Imbros Gorge (perhaps it will give you an appetite for adventure); visit an unmissable private war museum and an important pilgrimage site to the Virgin Mary. Rustic kafenia lie by the wayside, and at the end you can dine on great trout and sturgeon in Argyroupolis, not to mention take a short walk and purchase some unique natural produce. Leave Georgioupolis via the street lined with eucalyptus trees and then, before you reach Vrysses, take the bypass signposted for lorries towards Chora Sfakion. The road is in good condition and winds its way up to the Askifou Plateau, 730 m above sea level and the core of Sfakia's landscape. Just after the pass summit, you can easily pull over and enjoy the view across the whole plateau. Thanks to a high water table it’s very fruitful, and fields and farmland are tilled there to this day. Wine and grain, in particular, are cultivated here, and with EU funding a small furniture workshop has been developed, where five people are employed. Opposite your viewing point, you will see one of two Ottoman fortresses, from which the Turks tried to keep the tirelessly rebellious people of Sfakia at bay. Across the whole plateau, approximately 400 people still live in four villages. The pass road then descends into the first of these villages, Kares. Here you should be sure to take 20 minutes to pay a visit to the private War Museum - and perhaps also take in the scenery for a while from one of the nearby swings. This small village on the Askifou Plateau on the way from the north coast towards Chora Sfakion is worth a stopover because of its museum, which is small, admittedly, but impressively original. It commemorates the Second World War. Its founder, Georgios Chatzidakis (1931-2007), experienced the German occupation of Crete as a young teenager. Soon after the war ended, he started to search for relics of that time all across the whole island, and gather them up in his home village. Today, the exhibition contains over 2000 items, to which the collector added fences with a perceptibly odd aesthetic and other installations reminiscent of art. It is open daily. Rifles, pistols and machine guns are just as much as part of the exhibition as steel helmets (both intact and riddled with holes), canteens, T-mines, grenades and jerry cans. The personal utensils of the soldiers, in particular, give food for thought: for instance, spoons, forks and coffee mills. There are also rusty bicycles of the 'Bismarck' brand and a severely damaged propeller from a dive bomber (Stuka) on display. Andreas, the son of the museum's founder, and his wife Katarina have continued their father's work and accompany visitors around the exhibit, after which they are grateful for any donations. But what was the war actually like? In October 1940, the Italian dictator Benito Mussolini demanded the unconditional surrender of Greece, because he wanted to occupy the country. The Greek dictator at the time, Metaxas, answered with a resounding "no". To this day, this is annually celebrated as a national holiday on the 28th of October. It is known as the 'megalo istoriko ochi', in other words the 'great historic "no"'. After Metaxas said "no", Italian troops from Albania wanted to advance into Greece. The Greek military was able to drive them far back into Albania. Hitler refused to accept an Italian defeat. In April 1941, the German Wehrmacht intervened in the battles and within a few months they had occupied all of the Greek mainland and many islands. The 33,000 British troops stationed in Greece, and 10,000 Greek soldiers retreated to Crete. On the 20th of May, a German Air Landing operation began, with the primary aim of securing the three British airfields of Maleme, Rethimno and Iraklio. The Cretan cities were also heavily bombed. By the end of the month, Crete was occupied by Nazi troops. Many British troops were able to break through to the south coast thanks to spectacular campaigns and the dauntless support of the Cretan people. From there, they were brought to Egypt on ships and submarines. The Nazi troops, however, encountered fierce resistance from partisans during the whole occupation, and responded to their attacks with brutal mass shootings of innocent men, women and young people. In September 1944, the last German troops retreated to the far west of Crete, and remained there practically unchallenged by British troops until the end of the war. War memorials in practically every village commemorate the Greek victims of the war. Fallen German soldiers are interred in the German War Cemetery in Maleme, fallen British and Commonwealth soldiers in the Souda War Cemetery near Chania. Back on the main road, forget about the road branching off to Kallikrates for now, and continue into the village of Imbros. Park by the 'Porofarago' taverna, where a wooden sign draws your attention to the 'Main Entrance' to the Imbros Gorge. If you want to hike through the gorge, it's best to leave that for another day. You can take a short break in Porofarago taverna, where you can take a closer look at the arms of chairs made in a Cretan workshop: they are embellished with the outline of the island. The borders between the four regional units that traditionally subdivide Crete are also shown: Chania, Rethimno, Iraklio und Lassithi (eastern Crete). Hiking through the Imbros Gorge takes about 2.5 - 3 hours and can already be attempted in the early spring, when the Samaria Gorge is closed to visitors for safety reasons. It is relatively easy, almost entirely downhill, and is also suitable for families with school-age children. You can even get there and back on the public bus. The hike starts at approximately 700 m above sea level at the southern end of the village of Imbros (approx. 25 km from Georgioupolis) below Porofarago taverna, and ends close to the Libyan sea in the hamlet of Komitades with many tavernas that cater perfectly to hikers. The owners of the tavernas also organise return transport for hikers to your starting point in Imbros. They ask about 20 euros/vehicle for the service; sometimes passengers take a seat on the cargo area of a pickup truck. It costs 2 euros to enter the gorge; the entry fee is used to maintain and clean the hiking trail. Moreover, it's used to pay the wages of the two trail rangers and provide food for the donkey that is stationed in the gorge for emergencies. The Imbros Gorge is approximately 7 km long. Before there was a tarmac road, the path through the gorge was the only connection between the Askifou Plateau and Chora Sfakion. At its narrowest point, the gorge is only about 2 m wide, the steep slopes and the base of the valley are lusciously green, although water hardly ever flows through the gorge. The most striking blossoming plants according to season include asphodelines, gorse, chaste trees, arum, Indian snakeroot and Greek sowbread; among the trees evergreen oak, carob tree, cypress trees and sycamore dominate. 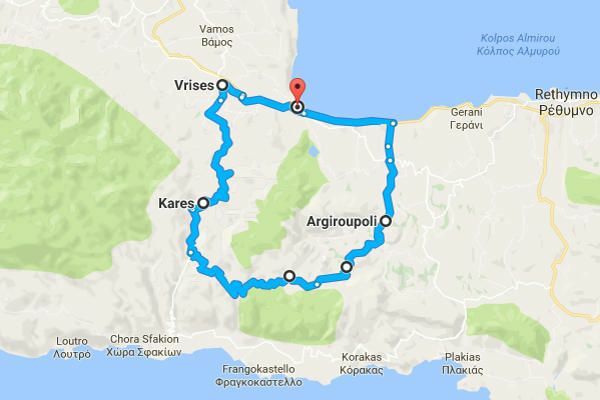 Afterwards, head back to the turn off to Kallikratis and now you will drive through an exceptionally isolated landscape, where countless asphodelines blossom in April and May. The hamlet of Asfendou lies in a tiny high valley. Then continue high up over a further pass to the somewhat larger plateau of Kallikratis, with many small vineyards, two kafenia and a taverna. In winter, only five people live here. In summer there are more, as the landowners drive their sheep and goats up here from Frangokastello, which is down by the sea. The road branches in the village. First follow the small, wooden sign to the 'Little Café' (closed on Mondays, but otherwise open from 11 am). It belongs to Janina, a Danish lady married to a Cretan called Babis. She distils fine essential oils, tinctures and perfumes from all kinds of Cretan herbs and plants, which you can purchase together with homemade soaps and shampoos in the café. The homemade lemonade is delicious, and the water with diluted carob syrup is worth a try. After this break, drive back to the fork in the road in the hamlet, and now turn right in the direction of Argyroupolis. Again you will ascend a high pass and now you will see a broad valley lying before you. There's a fork in the road. Left will take you to Argyroupolis via Asi Gonia, and right via Myriokefala. Take the better, more interesting road to the right and head towards Myriokefala . At the centre of the village stands the eponymous monastery, no longer inhabited by monks or nuns, with a church of the Virgin Mary, which is an annual pilgrimage site for many thousands of Cretans on the 7th/8th of September. The numerous dormitories and sanitary facilities around the monastery courtyard were also constructed for these pilgrims, and remain empty for the rest of the year. The reason for their pilgrimage is an old, miracle working icon of the Virgin Mary, which you can see on the wall on the left-hand side, richly embellished with small votive tablets and other thanksgiving offerings. The two ancient grape vines under the west ambulatory of the monastery courtyard are also worth seeing. As you continue on to Argyroupolis, you will see the large village of Asi Gonia on the other side of the steep valley, extending along the bare slopes of the Fourni massif, 1492 m above sea level. Most of the villagers are stock breeders, and there are several cheese dairies in the village; however, it's not necessarily worth the drive. We recommend that you use your remaining time on this daytrip for the attractions in Argyroupolis: the trout restaurants by the gushing springs, a walk to the church of the five Holy Virgins with its many ancient graves, and a walk through the historic village centre, where you can get to know and purchase all kinds of products made from avocados and carob. You can then be back in Georgioupolis in time for dinner.